Baykeeper recently won new protections for the Napa River and Sonoma Creek—both tributaries of San Francisco Bay—from pesticide pollution. Grape growing for wine production tends to rely heavily on pesticides, fertilizers, and other potentially harmful substances. Contaminated soil and water running off vineyards seep into nearby waterways, which can carry polluted agricultural runoff all the way to San Francisco Bay. 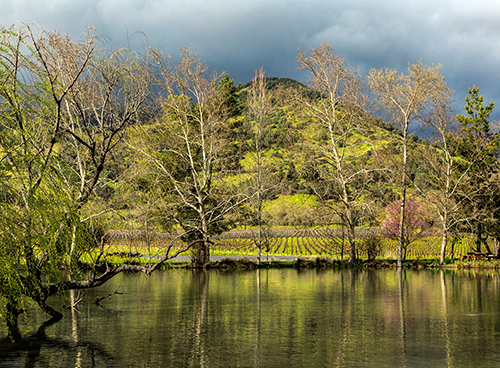 In addition, soil eroding from vineyards can muddy nearby creeks, making it difficult for fish to navigate and spawn. Pesticides can have particularly adverse effects on fish and aquatic wildlife. For example, some pesticide compounds mimic the effects of estrogen. As a result, fish species like Chinook salmon living in streams near vineyards have developed unusual biological changes that impact reproduction. This estrogen mimicry also raises concerns about possible exposure for people who catch and eat pesticide-contaminated fish. In 2016, the San Francisco Bay Regional Water Board—which regulates agricultural runoff— began drafting permit requirements for vineyards, which mainly required reductions in soil erosion. The requirements did not, however, include sufficient limits on pesticides. To improve water quality for fish and wildlife, Baykeeper advocated for the permit to include robust pesticide control and monitoring. Earlier this month, the Water Board agreed to add Baykeeper’s recommendations to its requirements for vineyards to control pesticide pollution. The Regional Water Board now officially recognizes the negative effects of estrogen-mimicking pesticide compounds on fish. And, at Baykeeper’s suggestion, the Regional Water Board will conduct pilot monitoring for pesticides of high concern in the Napa River and Sonoma Creek. California’s love of wine doesn’t have to be at odds with our commitment to the environment. Many wineries are already addressing runoff pollution issues by investing in fish-friendly farming practices, and voluntarily reducing pesticide use or going organic. As this new permit goes into effect, Baykeeper will continue to keep watch on how vineyard runoff affects the Bay and its wine country tributaries.